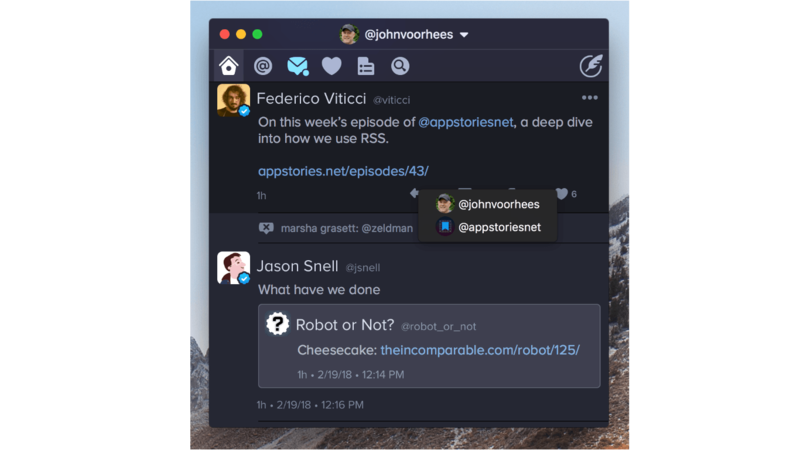 Hot on the heels of Twitter’s abandonment of its official Mac client last week, The Iconfactory announced new Twitterrific features and a price reduction. One of the highlights of the update is enhancements to multi-account support. 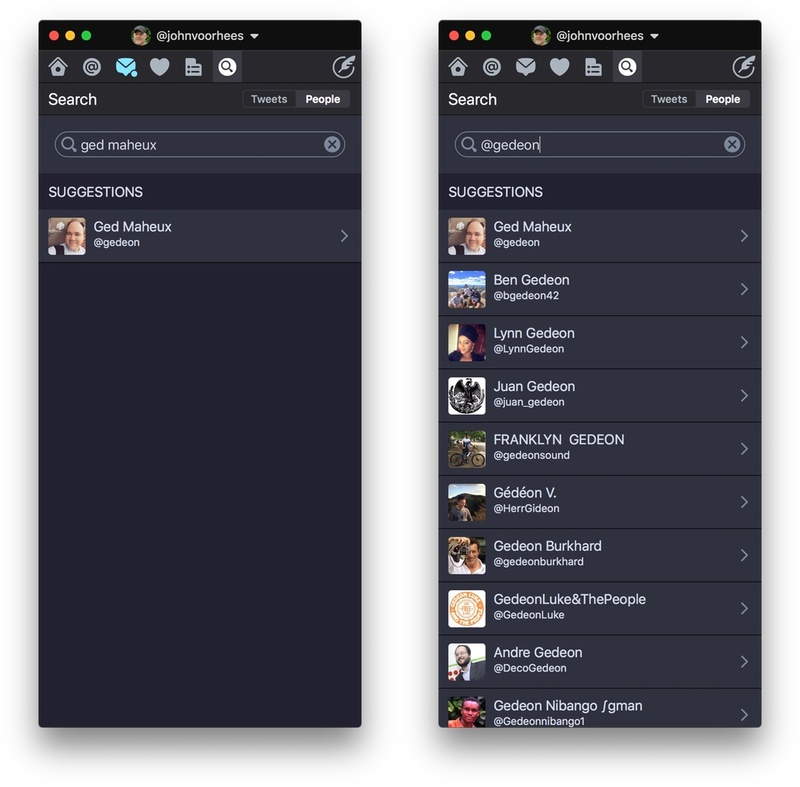 If you have more than one Twitter account set up in Twitterrific, right clicking on the reply, quote, retweet, or like buttons displays a popup window for choosing which account you want to use for each of those functions. Alternatively, if you are in the middle of composing a reply or quote-tweet, click on your avatar in the compose window to switch the account from which it will be sent. Lists of a person’s followers and who they follow have been added to user profiles. Avatars now include verified and protected status badges, although this can be turned off in Twitterrific’s settings. There is a setting to turn off tweet streaming, so your timeline can only be refreshed manually. Georgia is a new font alternative in the app’s preferences. 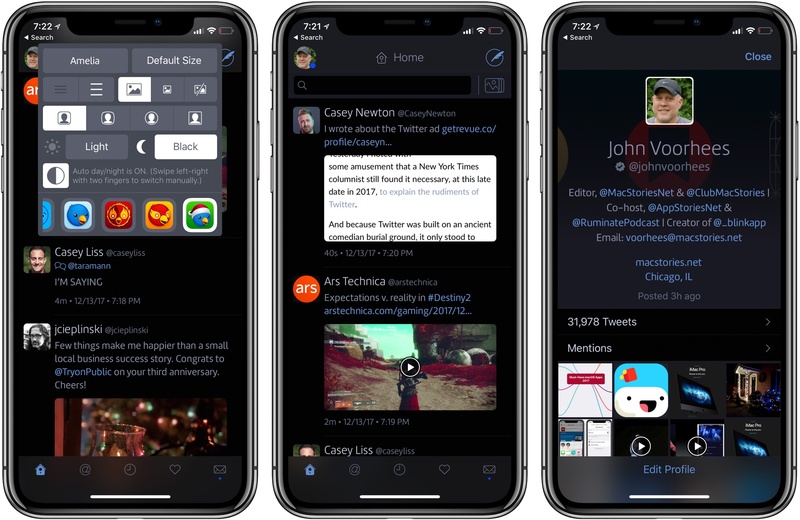 Twitterrific for Mac has come a long way since the commencement of its crowdfunding campaign last winter, and many of the shortcomings of version 1.0 that I highlighted in my review last October have been addressed. It’s fantastic to see Twitterrific continue to grow and evolve, especially now that Twitter has walked away from its Mac app. To celebrate the one year anniversary of Project Phoenix, the crowdsourced Kickstarter project that relaunched Twitterrific on macOS, the price of the app has been reduced from $19.99 to just $7.99. Twitterrific is available on the Mac App Store. Twitter dumped Tweetie’s codebase years ago, of course, and their Mac app has been garbage ever since they did. It’s all fine, really, so long as they continue to allow third-party clients like Tweetbot and Twitterrific to exist. But this “Mac users should just use the website” attitude is exactly what I was talking about here as an existential threat to the future of the Mac. Twitter’s move is not surprising given the history of the app. Most Mac users I know moved on to third-party clients years ago. However, Gruber’s broader point is an important one. There has been an increasing trend away from native Mac apps and towards web apps and cross-platform apps based on technologies like Electron. Many of these non-native solutions are resource hogs, and even the best often fail to take advantage of OS-level features, which makes them feel out of place among native apps. 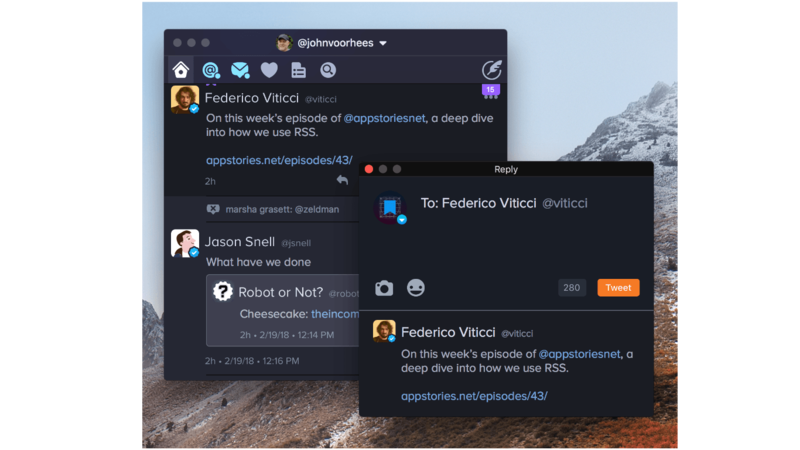 Perhaps the rumored Project Marzipan is designed to reinvigorate Mac development, although it’s hard to see that working if companies like Twitter simply don’t care to provide the best experience on macOS. Last night on Twitter, I noted that the company's iOS app now appends a query parameter based on an app's bundle identifier when you share a tweet's link via the system share sheet. I didn’t know Twitter for iOS appended parameters for app bundle IDs every time you share a tweet’s link with extensions. As some have noted, this appears to be a recent change in Twitter for iOS, which is less than ideal as the resulting link contains a long string of URL-encoded garbage. More than ugly URLs, however, what bothered me was Twitter's implicit tracking of which apps users invoke to share links with – something that even applies to core iOS features such as Apple's own Messages extension. I wondered whether Apple should consider this a violation of App Store guidelines, but it appears that Twitter isn't breaking any rules by appending app-based query parameters to their shareable URLs. Benjamin Mayo looked into this feature and explained how Twitter is leveraging public iOS APIs to read bundle identifiers from the share sheet – he even posted a proof-of-concept code snippet to show how it'd work in practice. In reality, this is very easily achieved. As part of the activity provider API, the system asks for content to share for each sharing extension the user has installed. The Apple framework openly passes the activity type to the app. Twitter simply takes the base URL it wants to share and appends the ‘garbage’ before returning. The important thing to note here is that the mechanism is innocuous and uses valid APIs provided by Apple. Twitter is not exploiting private APIs to achieve this. A cursory look at the app review guidelines suggests to me there are no grounds for Apple to scold Twitter (or any other app) for doing it. My personal stance is that this is annoying but does not violate user privacy. Importantly, Twitter cannot append arbitrary information to its URLs system-wide; it is confined to cases where users share something from inside the Twitter app itself. I don’t really see a justification for Apple to amend the guidelines to disallow it. I just take it as another reason not to use the official Twitter app. In conclusion, if links to tweets you copied from the Twitter app suddenly look longer and messier than before, this is why. Personally, while Twitter may be taking advantage of a publicly available API, I still think the implementation is, at the very least, in poor taste – especially because it's coming from the same company that used to scan users' devices to list installed apps and deliver "tailored content" based on them. Even though I won't stop using the Twitter app because of this, I wish Twitter would revert to standard, clean URLs when sharing tweets from the app. I also hope Apple is taking a closer look at this. Earlier today Twitter announced that you'll now be able to use a third-party app (such as Google Authenticator, Authy, or 1Password) for two-factor authentication instead of SMS. The company has updated their support document with instructions on how to set it up here. This is great news as Twitter was the last service with 2FA that only supported sending codes via SMS. Switching from text messages to 1Password (which I use for one-time codes) was easy: in Twitter for iPad, I went to Settings ⇾ Account ⇾ Security, and enabled the 'Security app' toggle. I then selected to use another app to generate my codes and opened 1Password on my iPhone, where I hit Edit on my Twitter login item and scrolled to the OTP section. Here, I tapped the QR button, scanned the QR code Twitter was displaying on my iPad with the iPhone's camera, and that was it. Unless you specifically want to receive 2FA codes from Twitter via SMS, you should consider switching to a dedicated authentication app: these codes work independently from carriers and location, and they can be generated offline. Twitterrific 5 for iOS was updated today with several new and improved features. My favorite addition is a true black theme that looks striking on the iPhone X. Users that pick the black theme are given a choice between a dark theme that has been modified for ‘greater contrast and clarity’ and the true black theme. The app’s design has undergone other changes too. Users can pick avatars that are rounded rectangles, circles, squares, or squircles, and text sizes can be adjusted with more granularity thanks to the use of Dynamic Type. Muffles, which are rules that partially hide tweets from your timeline, can be temporarily disabled now. Previously, the only way to deactivate a Muffle was to delete it. Twitterrific’s experimental support for polls, which debuted on macOS recently, has been added to the iOS app too. To celebrate the holiday season, The Iconfactory has also added a new icon option: ‘Jolly Ollie,’ which features Twitterrific’s mascot in a Santa hat. Twitterrific is available on the App Store. Twitter's latest feature – which is rolling out "in the coming weeks" – is another that's been inspired by something users have been doing for a few years now: threads. As far as I can tell, this is a prettier interface for the original method of creating a thread by replying to yourself. Twitter has integrated a multi-post feature into the app's compose box, and there doesn't seem to be a new API endpoint for threading. It seems like a nice workflow with a 'Tweet All' button at the end. In theory, popular third-party clients could replicate the same behavior (and design) in their own compose UIs – just like various tweetstorm utilities create "threads" by posting multiple replies in a row. The Iconfactory is on a tear with Twitterrific for macOS updates. Version 5.0, the crowdfunded rebirth of the app, launched less than a month ago. A couple of weeks later, Twitterrific 5.1 added muffles and mutes, which we discussed on AppStories this week. Then yesterday, Twitterrific 5.2 dropped, with support for polls and and an enhancement of its user search functionality. Poll support is notable because third-party developers don’t have access to Twitter’s polling APIs. Instead, users of third-party Twitter clients have had to go to the official Twitter client or the web to vote in polls, which I rarely bothered to do. Lack of API support hasn’t stopped The Iconfactory from implementing a workaround to make polls available to its users though. The feature isn’t perfect, but in my preliminary testing, I’ve been impressed with how well it works. Twitterrific detects tweets that include polls by looking for clues like whether ‘#poll’ or the graph or ballot box emoji are used. The app also looks at the format of the question posed. If a tweet looks like a poll, Twitterrific displays a button below the text of the tweet. When the poll button is clicked, a popover with a mini-browser opens the poll so you can vote and see the results. 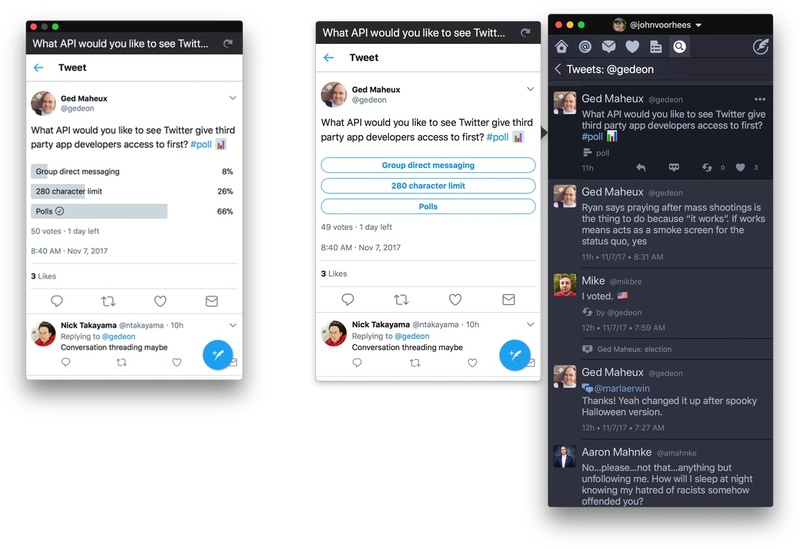 If you want to monitor a poll, drag the popover away from your timeline to transform it into a standalone window that will stay put and can be refreshed with the latest results. Poll creation still requires Twitter’s app or website, which cannot be avoided. Nonetheless, I can already tell that being able to open a poll, vote, and view results all from Twitterrific is going to increase my participation in them. For now, the feature is available on macOS only, but it is under consideration for the iOS app depending on how well it is received by users on the Mac. Use the Cmd+U keyboard shortcut to search for a Twitter user quickly. Twitterrific also added fast user searching via the Cmd+U keyboard shortcut and has improved syncing of your timeline position between iOS and macOS. 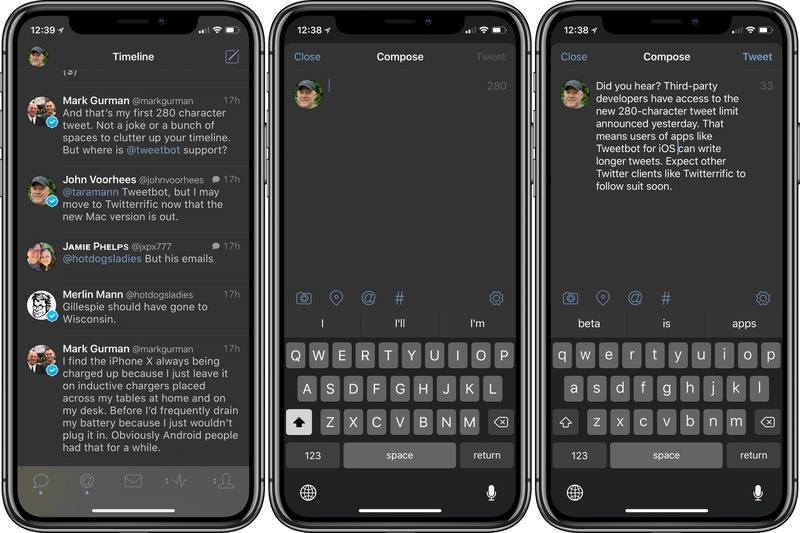 Next up for both versions of the app is support for Twitter’s new 280-character tweet limit, which, unlike polls, is available to third-party developers. If you’re interested in trying a new Twitter client, Twitterrific is an excellent choice. The handful of gaps in the macOS version’s original feature set are being addressed rapidly and innovative approaches to things like polls set it apart from its competitors. Twitterrific 5.2 is available on the Mac App Store.